Stepping stones trail from the open patio into the grassy area of the back garden. Veering right takes you to the circle garden. Named as such simply because of its circular shape. Using ground cover of Trachelospermum asiaticum minima jasmine or asiatic jasmine as the floor covering the circle becomes pronounced. The perimeter beyond the jasmine a 4 foot wide pine-needle ladened walk way. An extra large container garden centered directly in the middle as a focal point. The circle garden serves as a central hub of-sorts connecting several other pathways. Curving natural pine needle and stone foot-paths wind you further through more garden areas growing in the southeast portion of the back garden. Just around this planting the circle path leads to the tropical pathway. It was carved out last September (09) displacing a large grassy area. Diminishing lawn areas to replace with plantlife is a very gradual process. It's a good idea to store up lots of energy, time, and have a workable plan in mind before embarking on such projects. Turning this corner one can choose to trail around through the butterfly garden and the (quasi)wildflower garden by steering more to the south ... OR for today let's stick to the route that strolls us through the tropical pathway more eastward. It was designed to curve in and out of lush plantings that line its borders. A seating area for two with naturally-aged cedar chairs was included for a restful stop under the canopy of the shady oaks. The pathway is also a favorite hang-out for wildlife. The birds especially making use of two birdbaths along the way and several bird feeders stationed close by. No matter what the original plan for such a project looks like on paper or in one's mind (or however we individually approach these gardening ventures) you can be sure it will be adjusted along the way. The choices are many and in a tropical understory there is almost always a way to make room for more plants. 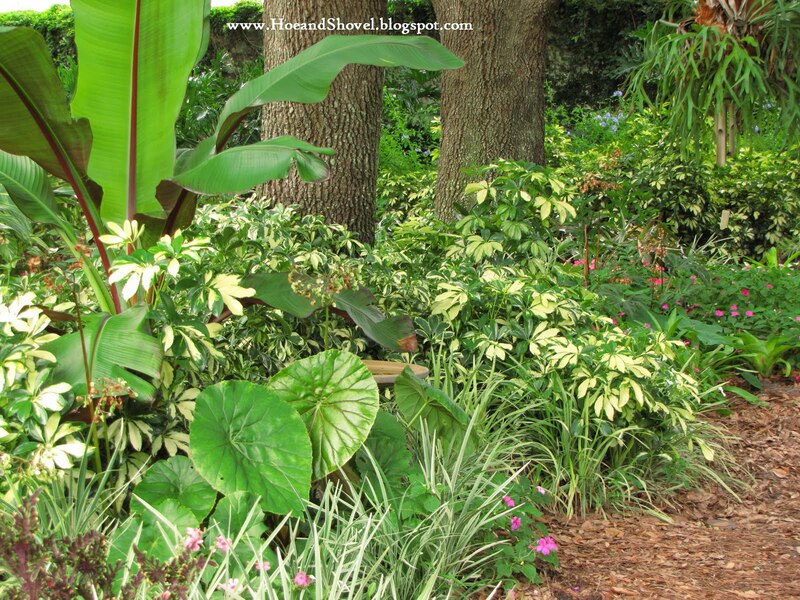 After all tightly planted lushness is what tropical is all about. On the right side of the path is a large, curving raised bed made of man-made stones stacked 4 high. 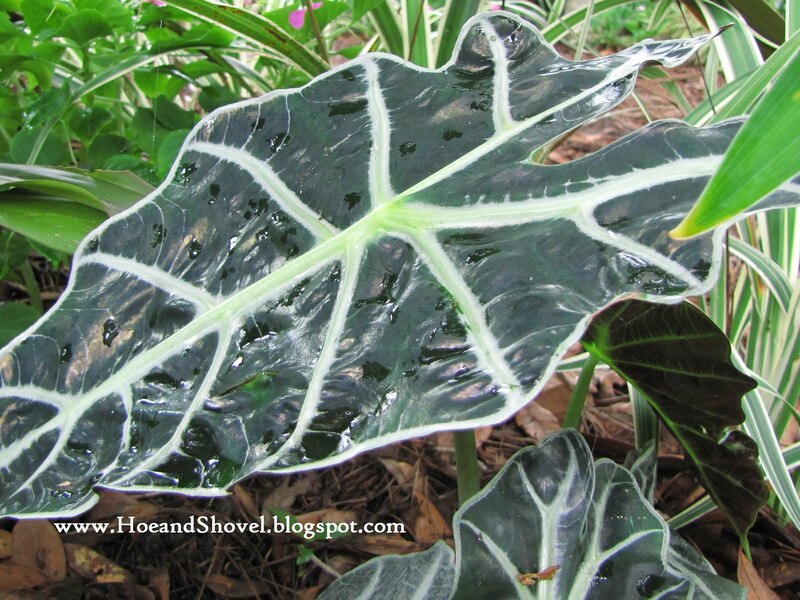 Many varieties of shade loving foliage have been planted in front. The 'wall' of stones previously stood out more prominently when the green grass followed its edge all the way around. 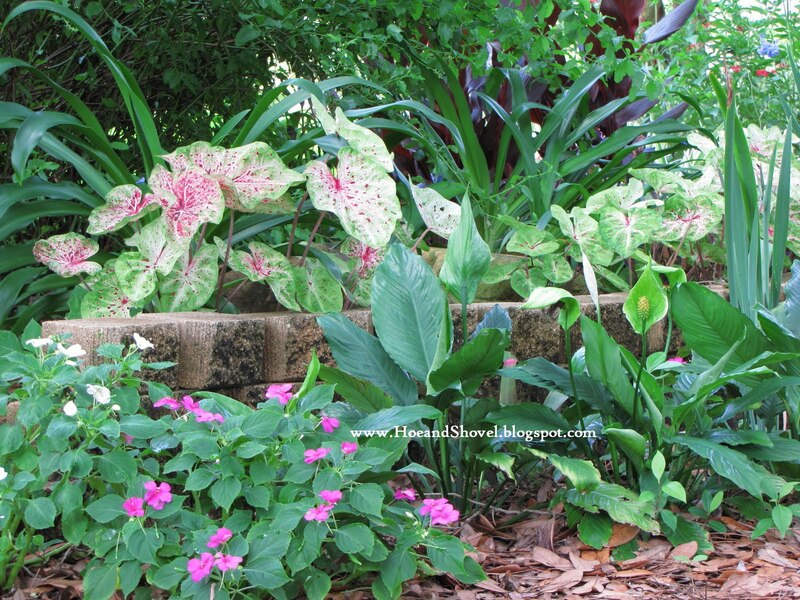 The softer look of the foliage provides a more soothing appeal in this cool, shaded setting. Miss Muffet caladiums pop out year after year in springtime. 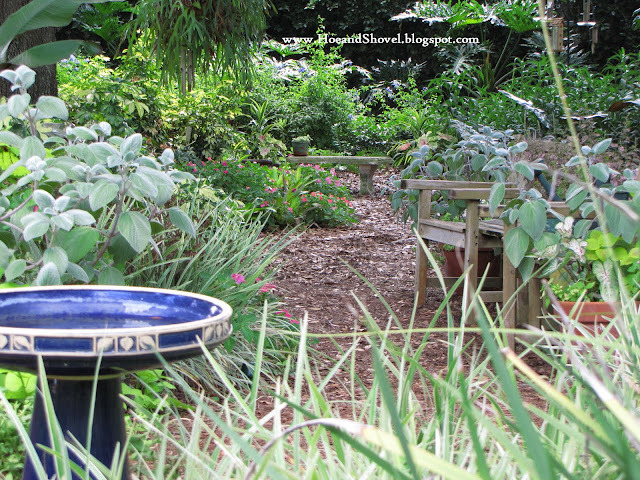 Mixed with agapanthus and sitting at the feet of blue plumbago it now overlooks the newest foliage. 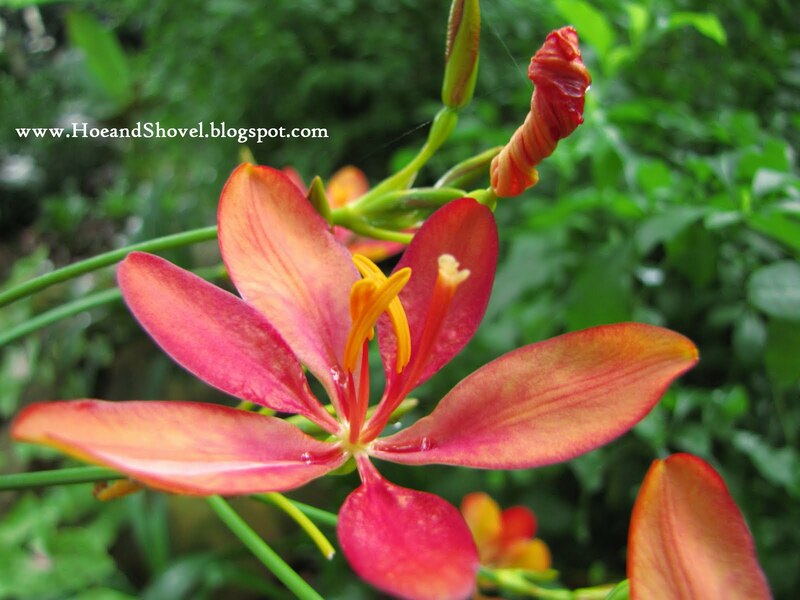 Pass-along Belamcanda Chinensis candy lilies are still blooming. Their lengthy stalks towering almost as tall high as the Crinum augustum 'Queen Emma' at the curve of the raised bed. This spring several Alocasia x amazonica 'Polly' were added at the feet of taller, larger-leaved specimens for their favored size, shape, and uniquely veining foliage. Not to mention they are oh, so tropical and begged for a home in this area of the garden. Filling in a previously grassy inlet holly ferns, bromeliads, birds nest fern, buddha-belly Jatropha podagrica, Hardy star begonia heracleifolia and volunteer impatiens all added as mixed levels of ground covers. 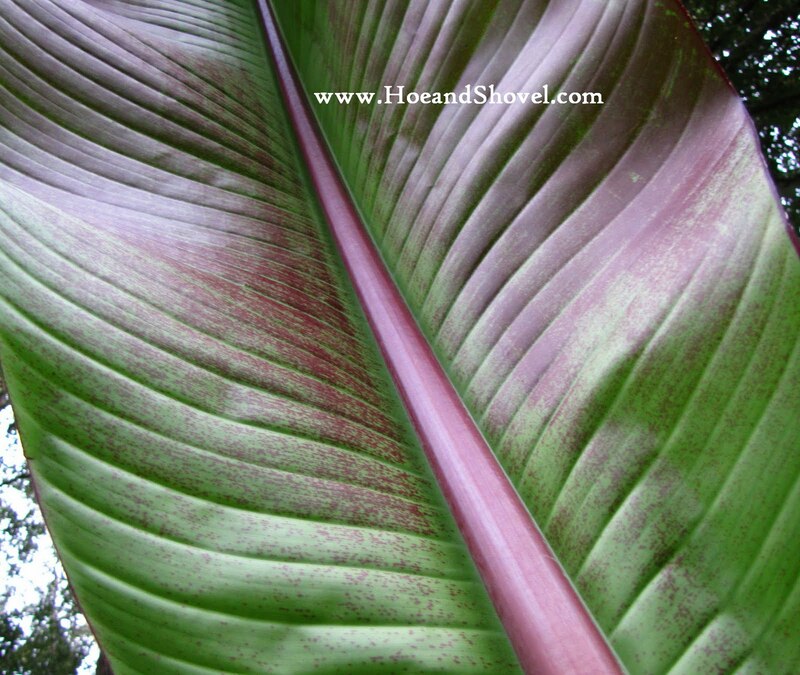 Over-sized leaves of different shapes and colors mixed together and repeated in nooks and crannies along the way are a must when designing to achieve a lush, tropical environment. Two red (false) banana plants, Ensete ventricosum 'Maurelii' were placed strategically to increase the volume and interest of the middle story. 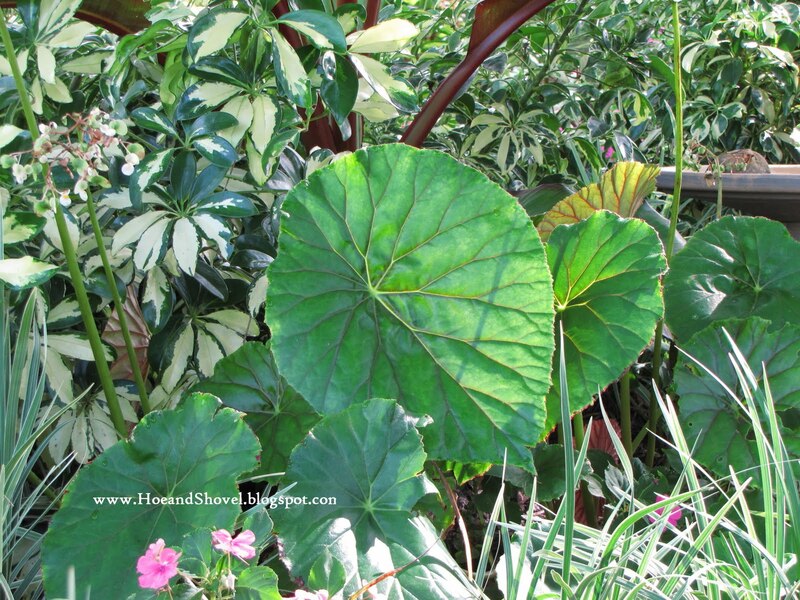 Siting extra large-leaved lotus begonias at the base makes a good combination. A large stag horn fern hangs from an oak limb further down. It was fairly easy to transition the pathway in this area increasing the sense of tropical habitat in this part of the garden. In the established backdrop tropical elements were already in place. 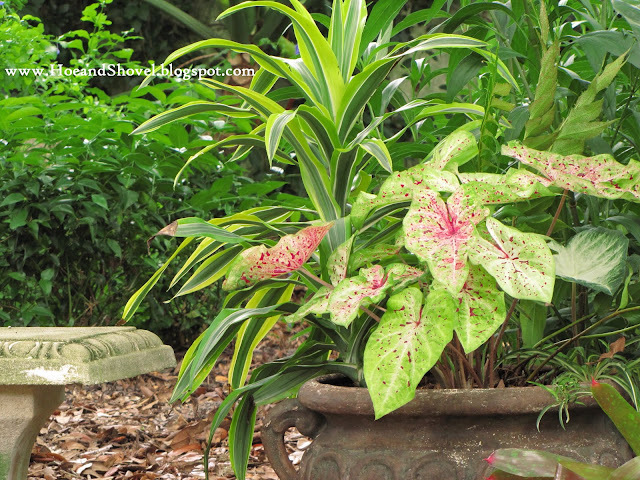 Repeat plantings of numerous Florida-Friendly foliage shrubs mixed with Florida natives create impact and serve as the foundation to continue to expand on. The towering, shady live oak trees surprisingly keep everything mostly protected through the winter. Another seating arrangement ~this time a cement bench ~ offers another place to stop along the way if so desired. A stone path begins on the other side of it that winds around through the furthest parts of the back garden. 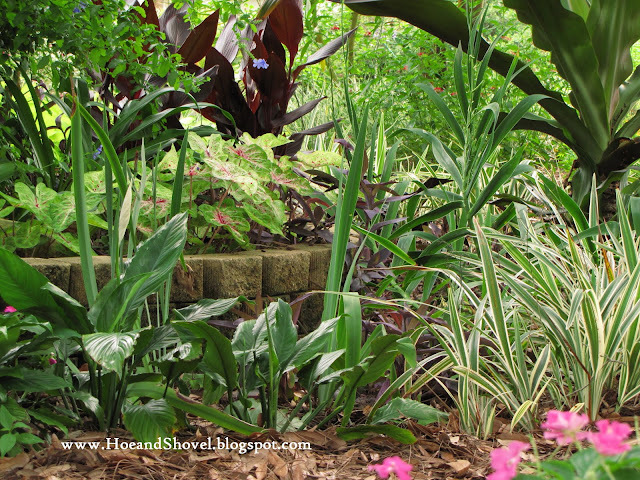 Or making a turn to the right is the second red banana Ensete ventricosum 'Maurelii' and my personal favorites, the Black Taro Alocasia plumbea with lots of bromeliads and caladiums filling in the ground underneath. Lemon lime dracaenas make a wonderful chartruese contrast against any darker shades of green in the shade. 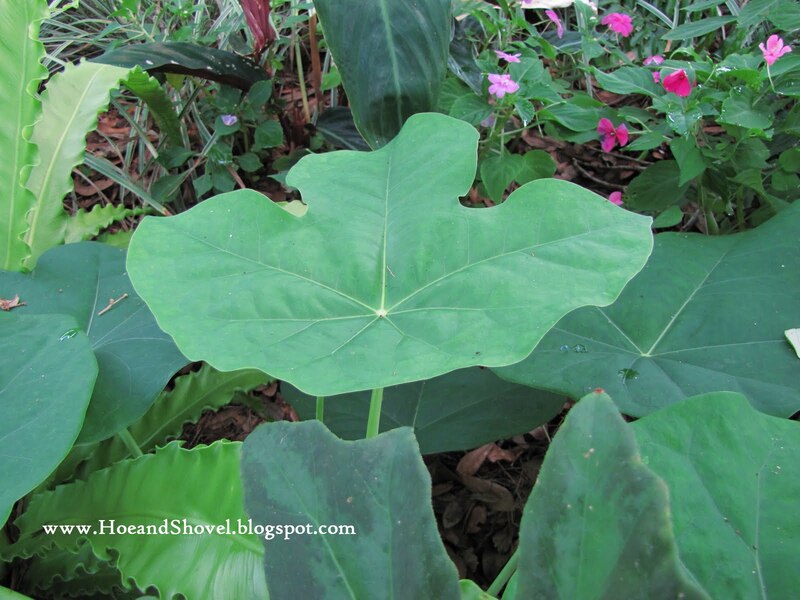 The entire length of the tropical pathway is approximately 35-40 feet and about 6' across at its widest point. It was left that wide to be used as the main passageway to the compost piles with a fully loaded wheelbarrow. As with any project that diminishes the lawn area consideration for easy access to all points in and around the new plantings is a must. After almost a year of growth and many more plants added this spring I have to admit I don't miss the grass at all. *********************************Side note: some of these photos were taken at sun down creating the yellowish cast of the setting sun. Many were taken in the morning as the sun dapples through the oak trees. All photos are copyrighted. None of the photos have been altered in any way... except for cropping in some cases. Ah, Meems. The inspiration I find here does wonders for me. 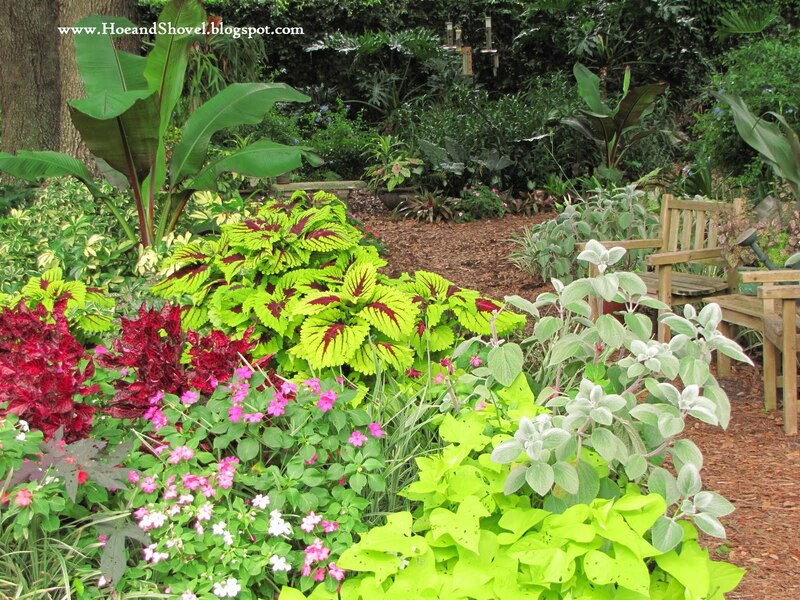 The diversity you have in your lovely garden is spectacular! We recently replaced some of our sod with pine straw and even without plant material in place (we're waiting for cooler weather), it looks so much more "Florida". Thanks for sharing your oasis. I so love your lush tropical plantings. This is definitely a post with photos I will return to for ideas in my own garden. You have thoughtfully placed each specimen and it shows each to its best advantage. The whole picture is one of cohesive tropical beauty. Wow Meems, what an inspiration you and your gardens are. We've lost most of our pine trees from hurricanes or that beetle that blew in with one of them, so lost our pine needle supply. There is something really nice about walking on a pine needle path. 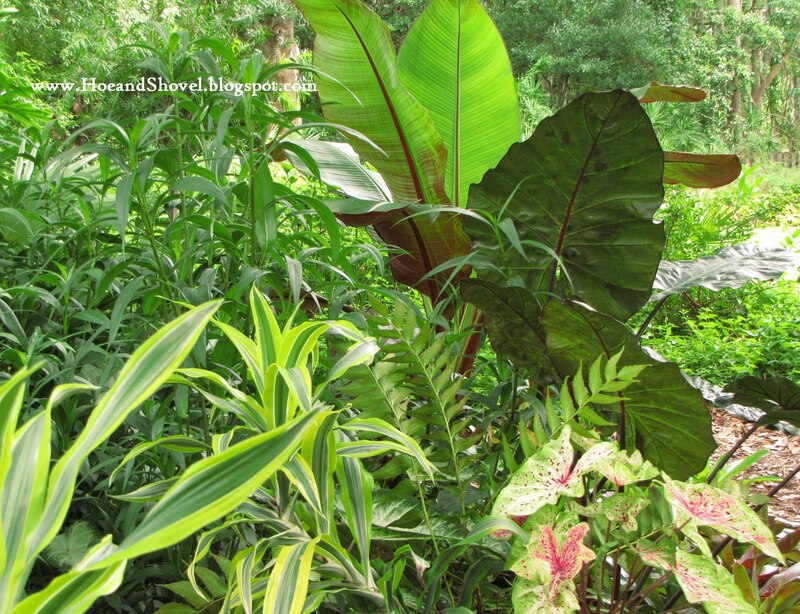 You have created a wonderful tropical haven, with so many different plants. It must be wonderful to walk around there every day, because you would always see something you might have missed earlier. It is all so lush too. Great job. Too hot for me to get out and do much these days, but this post sure gives me ideas for when it's cooler. 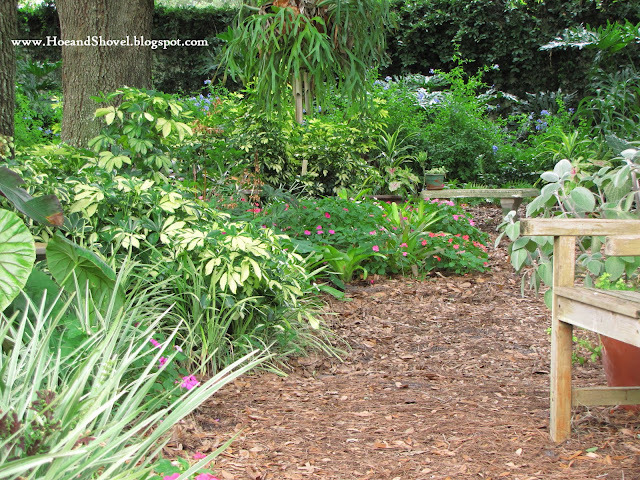 Your garden is tour-worthy and I want to be first in line to get the tour. It is absolutely gorgeous. I can only imagine all the work of getting this tropical paradise planted. If I had a greenhouse I would want one of those huge begonias you pictured. My goodness, I have never seen such a large begonia. Do they bloom like other begonias? I would love to sit on one of your benches and watch the birds and bugs zip around your tropical eden. Thanks for sharing. Meems, your garden is so gorgeous! This is a wonderful tour. I like the way you describe each area. I agree that the stone wall is much more soothing with the various platnings vs. turf. The transformation from turf to garden is truly beautiful! Nicely done. Thanks for the stroll, everything is so nice and tidy. I don't miss the grass that's been removed around here either. Nice new look to your blog. Wowsers, Meems! I love it ... the only way I'd love it more is to be there in person! It's so nice to have different seating areas...especially shady ones...throughout the garden. I like to sit and ponder changes I'll make to certain areas or watch the birds. When my Polly alocasia popped out of the ground in early summer I thought it was a caladium at first. They come out exactly the same way. I love the waxy look of them. Thanks for this walk through your tropical garden. I love gardens like that! I hope mine will be so lush if it ever reaches maturity. I wouldn't miss the grass either. I have less and less every year. We surely share many like plants, and I'm glad to see you growing them crowded like that. It seems to be necessary when growing tropical plants, doesn't it? I do like the pop of impatiens in your garden (I think I read before that you don't like them, but I do). I've had little luck with impatiens in my garden in the past few years. In the old Atlanta garden, they returned year after year, carpeting the ground with color. Possibly, there is just too much sun in this garden. I keep finding them popping up in odd places, like under a bird or a ti, not out in front of the border where I plant them every year and there's plenty of fallow ground left by their demise. Your garden is awesome.I've just started to plant, in ground. Your ideas are super, just wish you lived next door, to tap your input,your designs and friendship. Thank you so much for your photos & ideas. 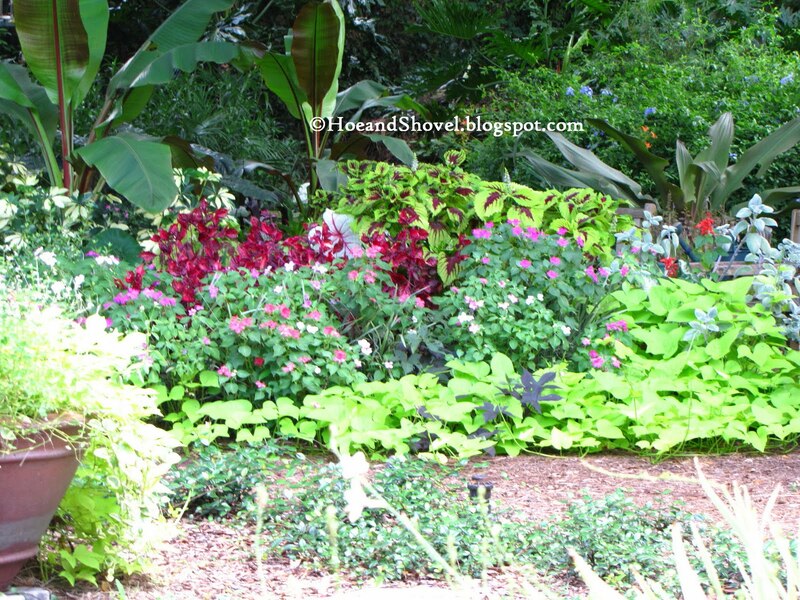 I live in SW FL, near Ft. Myers, transplanted from the midwest.Love your blog, it has given me many ideas & inspiration. Meems you got that part about "tightly planted lushness" so very right! And it does look absolutely topical. I can almost envision a tiger strolling out from among all those plants any minute! You could charge admission for your tours! :-) What a lovely garden you have. Your tropical pathway is full of wonders. Everything always looks so lush in your photos. Your kind comment is appreciated. Waiting for cooler weather to put in your plant material is wise. 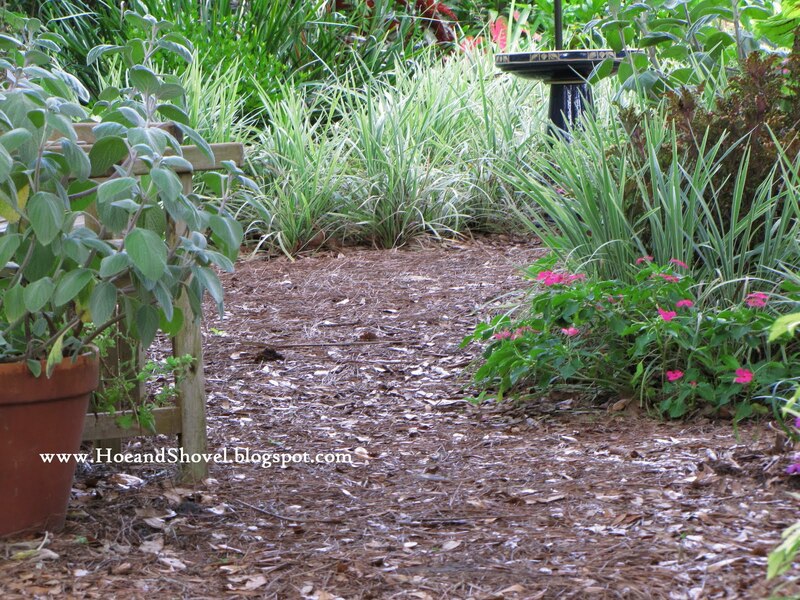 I DO love the "old Florida" feel a pine straw pathway gives to any area. I'm happy for you to come as often as you like. It is wonderful to me you can actually take something away from what you find here and implement it if you like it. You say the kindest things. Thank you. I admit it's not hard for me to walk through the garden each day but it would be visitors that might see something new each time. I kind of know every nook and cranny like the back of my hand having put almost every plant you see in the ground myself. Cooler weather is definitely going to be welcomed. I work through this heat but it is not my favorite time of year to do it. Thank you for walking through the tropical area with me and for your encouraging comment. The begonias bloom in the spring. 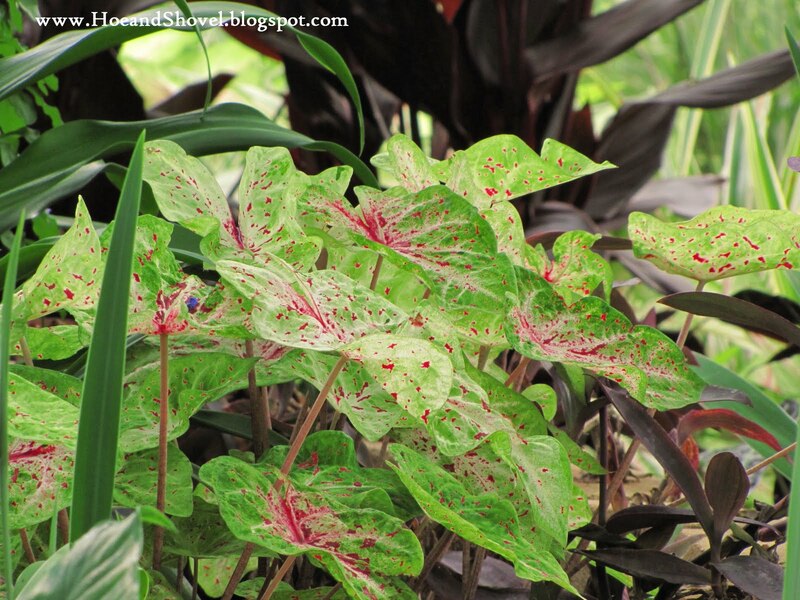 In this particular variety it is scape-like shooting up taller than the foliage and lasting for several weeks. Certainly it is another added feature that makes me love them more. It seems the more grass I remove the more I want to remove as each area now blends into the next. I do still have a large area left for the kiddos to play. But even so I keep inching my way into that. I would be happy with almost no grass .... keeping some adds a calm soothing palette ... I think anyway. There is a lot of controversy surprisingly about the removal of grass... we Floridians really do like our lush lawns it seems. You are kind to say those things. Seeing the rewards of hard work is always satisfying. It takes time but your eyesore will soon be fulfilling your dreams right there in your own garden! You are a hard worker. Thank you. The shade is life saver. The polly is SO unique to all the alocasias with its waxy outer layer ... almost appears indestructible. Then it goes dormant. I need to take some lessons in 'sitting' and 'pondering' or just 'being' in the garden. 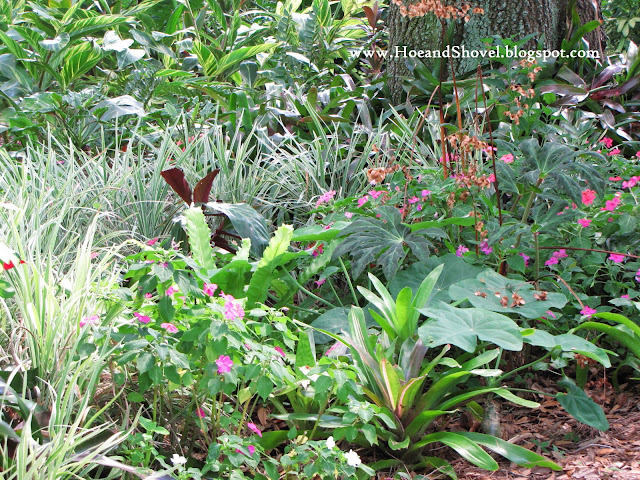 Quite a few of the plants in the tropical area were divided and transplanted from other places in the garden. That is one way to get lushness faster. 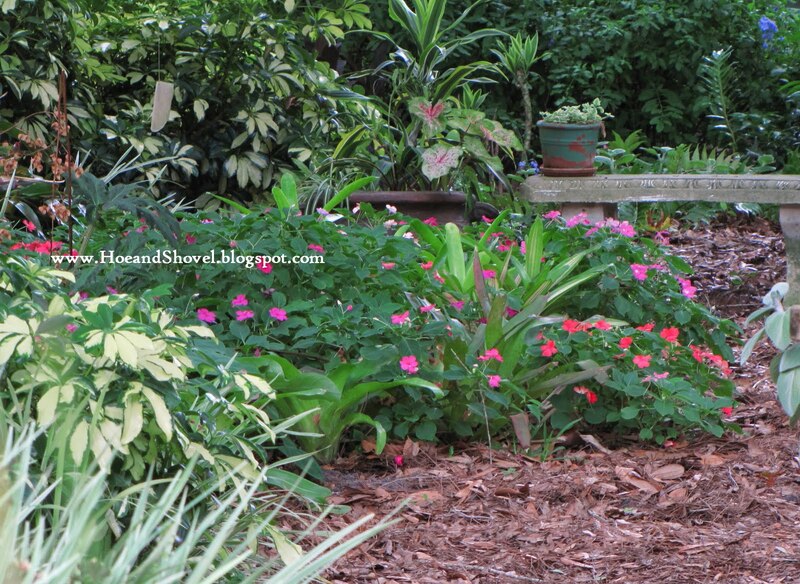 It's not that I don't like the look of impatiens when they look good. I do. But they re-seed themselves like weeds and want to take over places where I don't want them. I will say they are a nice addition in winter and spring when they are the happiest. Right now... even in the shade they wilt in the afternoon from heat and I'm not one to baby them with extra water... if they can't survive on their own then they get plucked out. I'm always in awe of anyone who can move here from the north and adapt to our climate. Growing a garden down here is SOOO very different than the midwest. I wish you luck... come back often and thanks for your visit. You can always e-mail me if you have specific questions... I'm happy to help if I can. Ha! No tigers... just armadillos and stray cats. GRRRRR... that's me growling~~~ not the tigers. And you always say the nicest things. 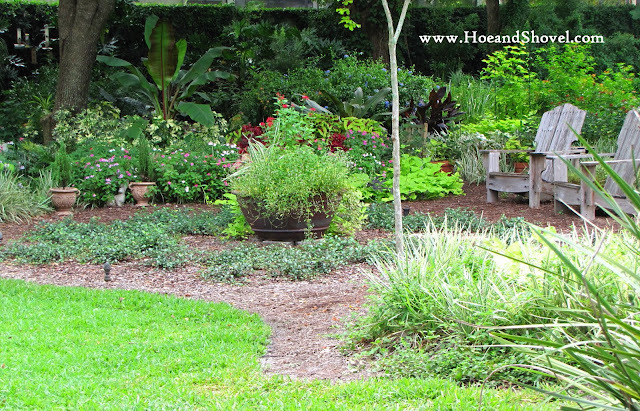 This part of the garden is happy due to the deeply shaded and canopied covering from the live oaks. Walking from the lawn to under the trees the temperatures are noticeably lower. Thank goodness. Gorgeous, just gorgeous. I never tire of reading or looking at your pics of your gardens. Your tropical path is quite inviting. We are 1/3 through converting a large area of lawn into a bamboo garden. Of course, we picked now, the most humid time of year to push towards completion. But, the freshly planted bambusa chungii barbellatas... our "baby blue bamboos" are loving the daily rains! Thank you for the tour and the inspiration to keep on sweatin'. And I never tire of your visits. Always good to hear from you. Oh how I wish I had made room for some bamboo somewhere here. It is just so refreshing and clean and tropical and so many other splendid qualities. I did a huge project last summer in July ... so I know what you mean. It will be so nice when it is completed for fall though. Rain skipped us here in the mountains! We could really use it. Love your Caladium and Tropical garden! 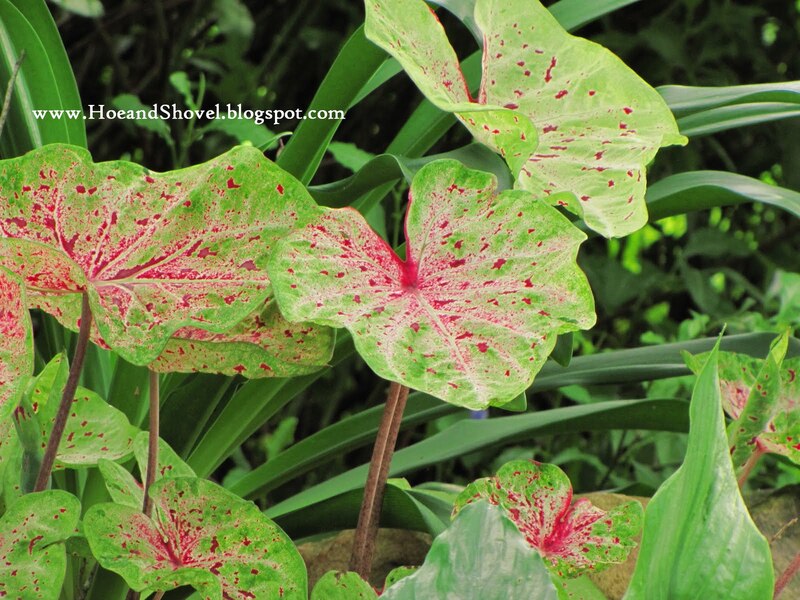 I wish we had the climate for Tropical plants since I've always been into them!